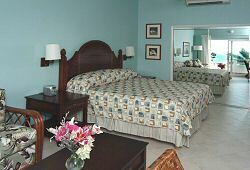 Antigua resorts & hotels: Trade Winds Hotel. 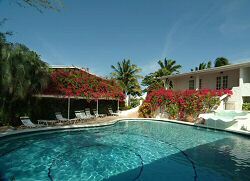 Welcome to Trade Winds Hotel an intimate Suite Hotel in Antigua where discerning guests have all the time in the world to relax in peaceful surroundings and enjoy fine cuisine accompanied by friendly, unhurried service. 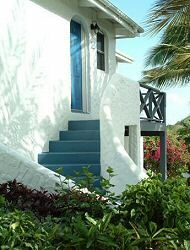 Beautifully situated on a hillside overlooking the spectacular Dickenson Bay and set within lush, landscaped gardens, this idyllic hotel, offering either room only or half board accommodation, exudes its own calming sense of tranquility. The 50 spacious rooms and suites, many with stunning vistas from their patios or balconies are all attractively furnished and feature the most modern comforts. A delightful palm-shaded sundeck close to the freshwater swimming pool affords plenty of opportunity to unwind and simply soak up the scenic views, while enjoying the cooling trade winds which inspire the hotel's name. Alternatively the pure white, powdery sands of Dickenson Bay can be reached in a few minutes, where your sun lounger awaits. 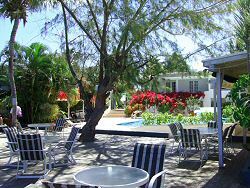 Those who feel more energetic can enjoy a wide range of watersports and other activities here. Our Front Desk Team are happy to advise on a range of activities and organise all tours and car rentals. An Ideal location for business travellers, we offer a range of facilities including a business centre and conference facilities. 15 minutes from the V.C. Bird International Airport and 5 minutes from the Capital of St. John's. Our Bay House Restaurant and Bar with breathtaking views of the nearby Leeward Islands, offers superb food and is open continuously between the hours of 7:00am to 11:00pm. We also provide services for those wishing to get married in our tropical gardens, or overlooking the fabulous backdrop views of Dickenson Bay and the Caribbean Sea. Click here to browse our Wedding and Honeymoon Packages and specials. To discover more about this intimate and stylish retreat, please visit our website.